Modulo is a simple, modular solution for Makers looking to build powerful electronic devices. When it comes to developing DIY projects, we as Makers love modularity. This was true back in the ‘50s when interlocking LEGO bricks, and even earlier, in the sticks-and-spool days of Tinkertoys. With that in mind, it’s no wonder why one Northern California startup has gone ahead and devised a set of swappable modules that will enable users to easily design electronic systems without ever having to assemble a circuit board from scratch. Each Modulo is equipped with its own little processor (ATtiny841) — aside from the mini color display that is driven by an Atmel | SMART SAM D21 — tasked with handling its operation and communicating with an ATmega32U4 driven Controller board. Using a connector on its back, Makers can easily slide their modules right into the so-called Modulo Base which securely holds them in place — no breadboard, wiring and soldering mess! What’s more, those wishing to use a Spark Core, Photo or Electron instead of the Controller can do so by selecting a Spark Base. “This vastly simplifies the process of building and programming devices, since you only need to deal with high-level concepts (e.g. get temperature or set motor speed) not I/O pin mappings, wiring, data sheets, and registers,” the Modulo Labs team writes. The Arduino-compatible Controller boasts six I/O ports that can be used as digital or analog inputs and digital outputs. 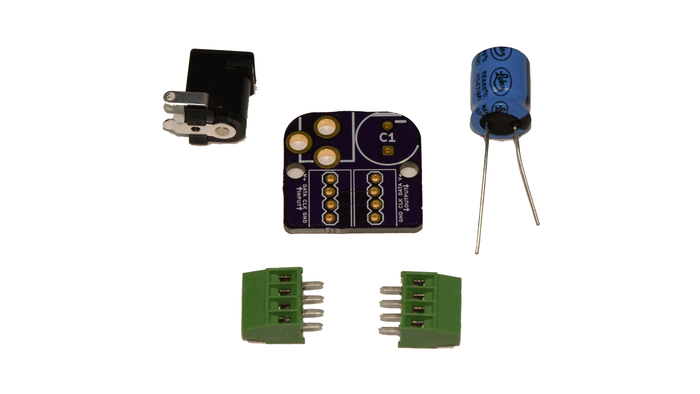 Four of the six ports can even be used to control servos or output a PWM signal. Additionally, each port has its own power and ground pins to help keep things nice and neat, while circuitry on the board will protect it from any potential wiring mishaps. As with a number of other DIY dev kits, Modulo is offering a wide range of components for its initial Kickstarter run. Among the initial modules are a color OLED display, a push-button illuminated knob, a motor driver, a thumb joystick, a temperature probe, as well as I/O and extension cables. In other words, all of the necessary resources a Maker would need to get started with their gizmo or gadget. Four modules can be connected to the Base at anytime, however for larger projects, these can easily be daisy chained together. When used with a Mac, Windows or Linux computer, a Maker will have the ability to manage all of their modules using Python over USB. The ATmega32U4 embedded board can also act as a bridge, enabling users to control their modules from Python running Raspberry Pi. Beyond that, they can choose to use the Arduino IDE to reprogram the controller or connect to the Internet with Spark. Communication between devices is accomplished through the standard I2C bus. So, what can you make with this development kit? For starters, though its creators highlight a variety of projects ranging from an intelligent water system to keep your grass nice and green to an automated fish feeder for Nemo to a tea-brewing robot for your crumpets, the possibilities are endless. “Modulo couldn’t exist without the amazing work of the open-source community, and it won’t exist without your generous support. We want to give back, so we plan to make the hardware, software, and firmware all open and available for you to use and modify. We’ll also provide eagle CAD files and firmware that you can use to create Modulos of your own design,” Modulo Labs founder Erin Tomson notes. Looking for a simple yet powerful modular solution to construct a DIY project? Look no further. 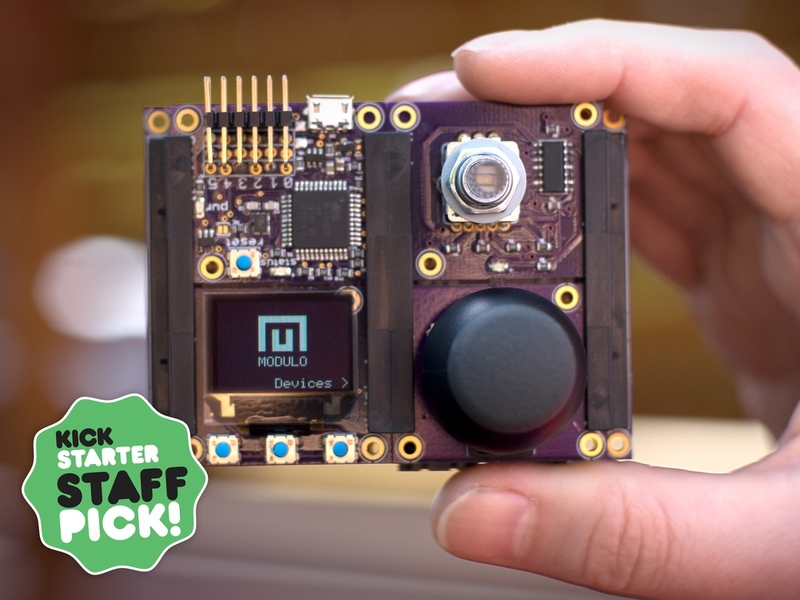 Head over to Modulo’s official Kickstarter page, where its team has already well exceeded its $10,000 goal. Shipment is expected to begin in November 2015. 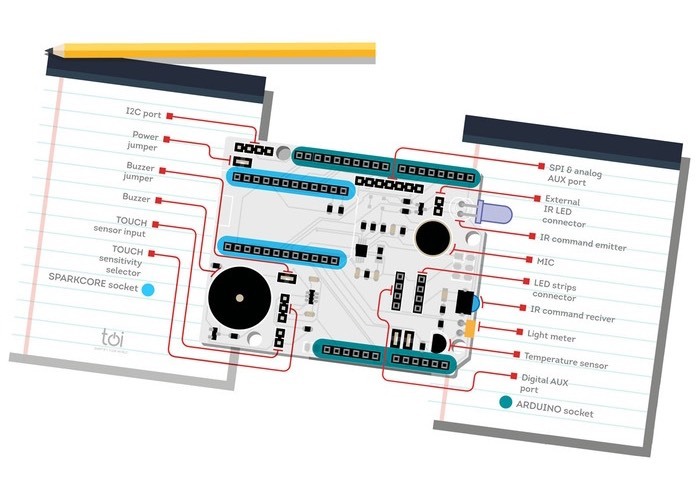 This entry was posted in Maker Movement and tagged Arduino, ATmega32U4, Development Kit, Kickstarter, Maker Movement, Makers, modular, Modular Dev Kit, Modulo, Python, Raspberry Pi on May 5, 2015 by The Atmel Team. 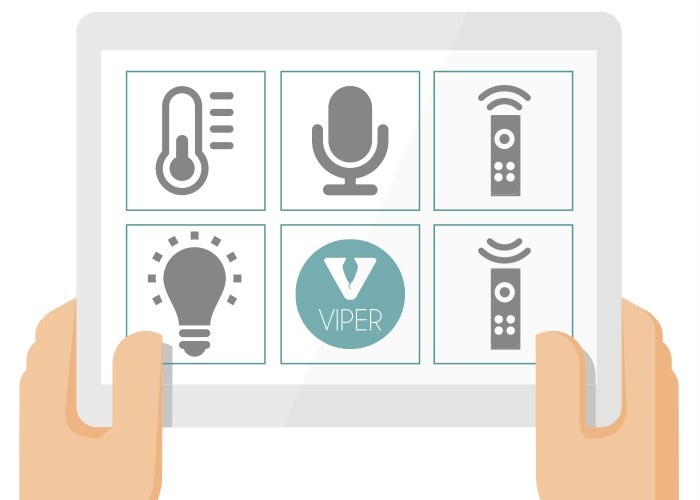 VIPER is a smart object development suite that brings cloud and IoT connectivity to your projects with just a click of the mouse. New York City-based startup ThingsOnInternet has launched a Kickstarter campaign for their new easy-to-use development suite for interactive Internet of Things (IoT) designs. 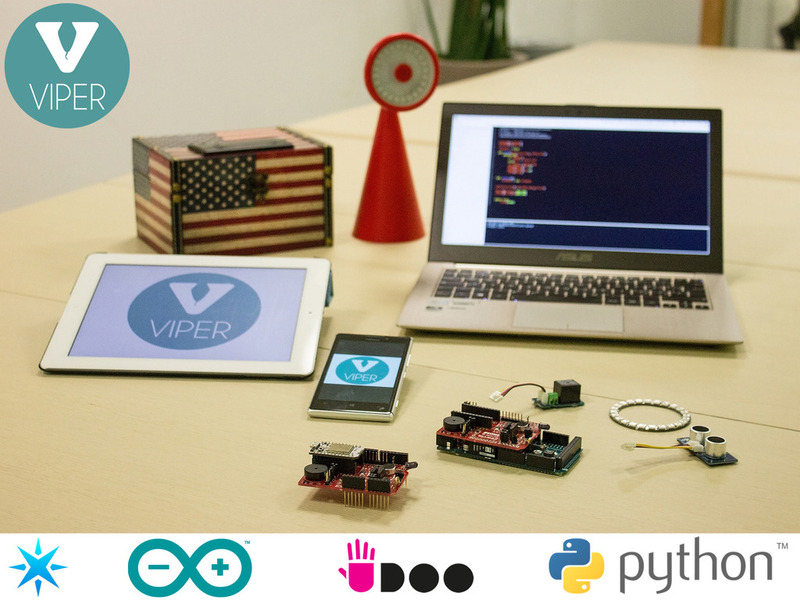 As its name implies, VIPER — or “Viper Is Python Embedded in Real-time” — makes it possible for Makers and embedded designers to create their next connected project in Python for Arduino, UDOO and Spark, all in in real-time. 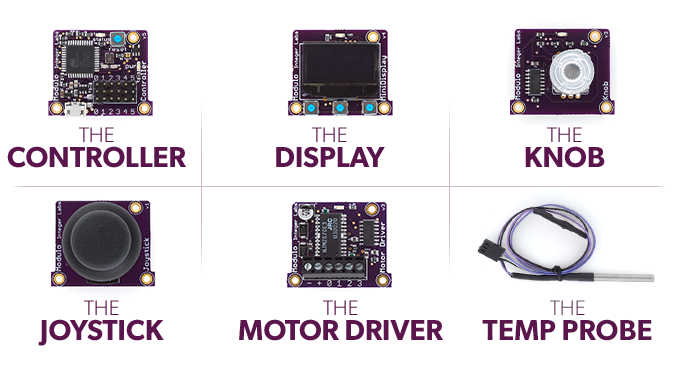 And, unlike other solutions that already exist today, this collection of products is platform-agnostic and compatible with all sensors and kits. The idea was first conceived after conducting some detailed market analysis, where the company discovered that designers, Makers and programmers all faced a similar set of challenges. In hopes of simplifying how “things” are brought onto the Internet, VIPER converged a series of components to better streamline the process. This included an IDE to manage and program the boards, a Virtual Machine to serve as its operating system, a plug-and-play TOI Shield, an extensive library of ready-to-use functions, and a mobile app to act as the interface for smart objects. On top of that, it’s also cloud-ready. With just a little coding, users can develop a wide-range of IoT applications, ranging from interactive storefronts, to home and industrial automation systems, to art and museum installations, to smart farming. “Designers aim to create behaviors that can co-exist at the same time and they are often frustrated by ‘anomalous’ and unexpected results on their projects. Makers, who have higher competences, invest a lot of time in understanding how to code multithreaded behaviors, how to manage interrupts in C++, etc. and sometimes their code become really hard to be maintained. Programmers are frustrated by executing ‘boring’ tasks for their customers, one of them is related (again) to multithread, interrupts, callbacks, timers and exceptions,” ThingsOnInternet writes. Since millions of developers already know Python, VIPER decided to make the programming language readily accessible for commercial interactive products as well, therefore amplifying the potential for smart objects to be as pervasive as mobile devices in their ease of design interactivity. To do this, VIPER provides a browser-based, minimal-installation development environment where users can write code with extensive library support and have it executed on any Arduino-like board. What’s great for designers is that, with VIPER, it leaves them able to focus on the features and functionality, not the tediousness, along with a mobile app to control their creation for free. In order to use the suite, Makers and developers simply download a one-time package from the company’s website onto either their PC or USB stick. Beyond that, VIPER includes an embedded, portable Python 3.0 engine to help make everything as easy as can be. Users can then launch the VIPER IDE and begin making. All that’s left from there is connecting its accompanying mobile app to serve as the UI for the project. VIPER runs on an Arduino Due (SAM3X8E), and can even be ported onto the recently-revealed Atmel | SMART Cortex-M7 family. As its creators reveal, code developed on an Arduino Due can also be implemented onto these new MCUs in a matter of two clicks. Furthermore, the suite features an Arduino and Spark Proton-compatible, plug-and-play TOI shield. Simply attach either a Due or Photon to the shield and start playing with any of the VIPER examples found in its library. 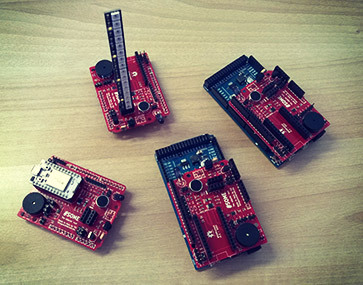 (This collection of modules includes CC3000 Wi-Fi for Spark Core and Adafruit Shield, Adafruit/Sparkfun Thermal Printer, Adafruit NeoPixel LED, RTTTL smart melody player, Streams library, as well as TCP and UDP network protocols.) Aux ports are even included, enabling the use of other sensors like Grove, ThinkerKit, Phidgets, and Adafruit NeoPixel LED strips. Through its IDE, users can ‘viperize’ theirs boards by installing them using the VIPER Virtual Machine. Once completed, a board is no longer a simple Arduino Due, Spark Photon or UDOO; instead, it has a multi-threaded, real-time operating system running on it, and a virtual machine ready to execute compiled Python 3 scripts. Ready to design your next smart project? You can head over to its official website, or check out the team’s recent successfully-funded Kickstarter campaign here. This entry was posted in Arduino, Arduino-Compatible, Design Trends, IoT, Maker Movement and tagged Arduino Due, Atmel | SMART, embedded, IDE, Internet of Things, Internet of Things Design, IoT, IoT Design, Kickstarter, Python, Python Programming, real-time, SAM3X8E, Spark Core, Udoo, VIPER on March 4, 2015 by The Atmel Team. AllPixel is an open-source board measuring just 2.7″ x 0.9” that provides easy USB control of all major programmable LED strips. Designed by the team at Maniacal Labs, AllPixel — which recently made its Kickstarter debut — is a USB interface capable of controlling up to 680 pixels on any popular LED strip equipped with a USB port. The AllPixel is a small, open-source board measuring just 2.7″ x 0.9” that provides easy USB control of all major programmable LED strips. It is compatible with Linux, Mac and Windows platforms, and can run on any device that supports Python, including Raspberry Pi, BeagleBone Black, or pretty much any desktop/laptop. “Working with addressable LED strips, we’ve found that the extra components required to communicate with and power them complicate designs and limit the options for how they can be used. Each chipset requires its own special protocol and supporting hardware components. This is where the AllPixel comes in. Think of it as a video card for your LED strips,” its team writes. 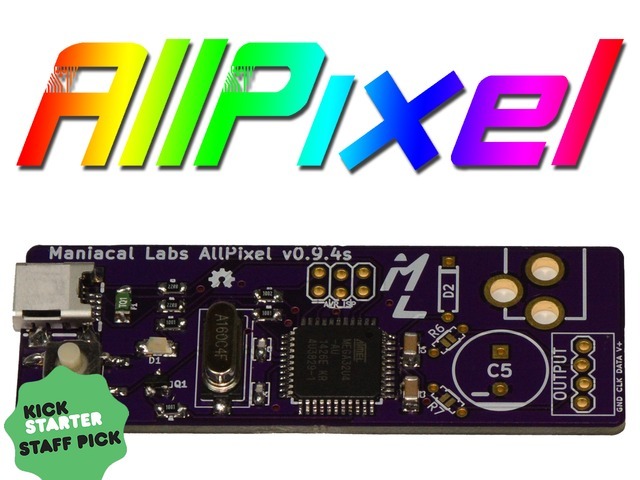 At its core, the AllPixel isn’t much different from other boards like the Arduino Leonardo, Arduino Pro Micro, or even Teensy 2. That’s because at the heart of the open-source device is an ATmega32U4, which as its creators note, “allowed them to provide such amazing frame rates, since it is capable of full 12Mbps throughput on the USB Serial connection. To achieve the speeds they desired, Maniacal Labs turned to Teensy Arduino cores and modded their own variant core. 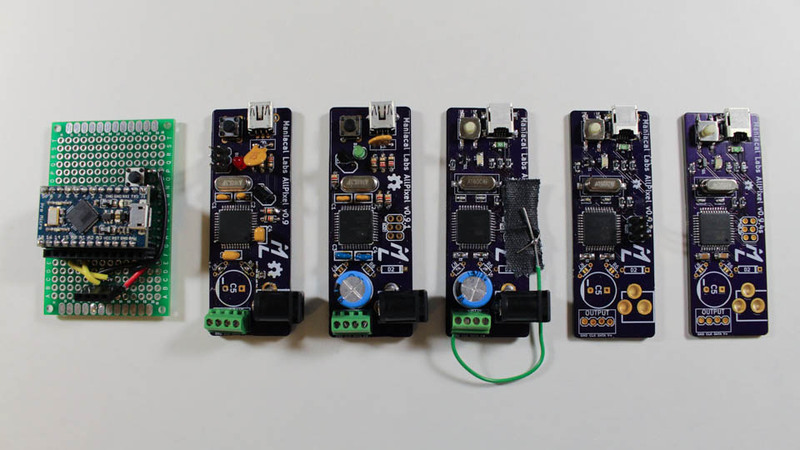 These newly-devised core libraries enabled them to run full USB speed on anything with an ATmega32U4, including their original Arduino Pro Micro mockup. The AllPixel comes with an assortment of optional user-installed parts to allow for a variety of hook-up configurations, ranging from a 2.1mm DC barrel jack and a 4-pin 0.1” male header to a 1000uF capacitor and 1N5817 Schottky diode. With the 2.1mm barrel jack, an external power supply can be connected to provide up to 5 Amps to the attached LEDs. According to the team, AllPixel can even be configured to power LEDs directly from USB power for short runs. In order to join and power multiple connected strips, the crew at Maniacal Labs developed the PowerTap, a small board with input and output terminal blocks and a 2.1mm DC barrel jack. They are offering this small board un-assembled, thereby allowing Makers to configure it as they see fit. “We’ve been working for over a year on a Python animation library called BiblioPixel. Where the AllPixel takes the pain out of the hardware interface to your LED strips, BiblioPixel takes the pain out of controlling your LEDs and programming your animations,” a company rep shares. Additionally, its companion FastLED library serves as the “universal translator” of the entire operation, which as the team points out, not only knows how to talk to all the different LED strips but is super fast doing it. Looking for a USB interface for all of your holiday LED needs? You may want to check out its official Kickstarter page here. Originally seeking $5,000, the team well exceeded its goal in a matter of just 48 hours. This entry was posted in Arduino-Compatible, Maker Movement and tagged AllPixel, Arduino Leonardo, Arduino Pro Micro, ATmega32U4, Kickstarter, LEDs, Maniacal Labs, Python, Teensy Arduino on November 17, 2014 by The Atmel Team. When it is reliable, public transportation is almost certainly the way to go, especially for those who are environmentally conscious. Take Adrian and Obelix, for example. These two university students recently hacked an LED dot matrix display to show arrival times for stops near their dorm. The duo found the display for the project, albeit with a defective controller, on eBay. However, Adrian and Obelix quickly swapped out the controller for a trusty AVR-based ATmega328P microcontroller (MCU) and TP-Link MR3020. “The ATmega328P does all the hard work pushing every line into the registers of the display and multiplexing, [while] the MR3020 takes care of network communication where it’s wireless interface comes in handy, because you only need to provide power to the display,” the two explained in a detailed blog post. It should probably be noted that the above-mentioned display actually comprises two separate displays – each with a resolution of 128*16 pixels. Indeed, each line is connected to a binary decoder. “Both displays have a common line select, clock pin, enable and latch, but separate data pins and data output pins, so we connected the first dataout to the second and get a virtual 256*16 pixel display,” the two added. Interested in learning more? You can check out HackADay’s write up here and the project’s official page here. This entry was posted in Maker Movement and tagged Adrian, ATmega328P, Atmel, AVR, HackADay, hacked, LED dot matrix display, MCU, microcontroller, Obelix, public transport display, Python, TP-Link MR3020, university students on March 4, 2014 by The Atmel Team. Is Leap Sheep the new Flappy Bird? There have been quite a number of hardware crossovers in the gaming world as of late, with the physical incarnation of Fawn Qiu’s Flappy Bird taking the Maker world by storm. As CNET’s Amanda Kooser reports, the Arduino-powered Flappy Bird in a box uses a scrolling background with two controls to move the bird up and down to avoid obstacles. One wrong move and the box lid closes, playing a “game over” sound. Recently, a Maker by the name of Tom Randle created a small robot to play Leap Sheep for him on the iPad. While not a full hardware crossover, the Leap Sheep ‘bot has nevertheless garnered considerable attention, with a write up of the project authored by Kevin C. Tofel prominently featured on Gigagom. According to Tofel, Randle uses an Atmel-based Arduino Uno board (ATmega328) to power the brains of his game-playing robot, which has solenoids and capacitive styli in place of finders. Randle says his creation isn’t perfect yet, as the original aim was to build a robot that was better at playing the game than a human. Interested in learning more? You can check out the Leap Sheep cheating machine on the project’s official page here. As we’ve previously discussed on Bits & Pieces, the DIY Maker Movement has used Atmel-powered 3D printers like MakerBot and RepRap for some time now, but it is quite clear that 3D printing recently entered a new and important stage in a number of spaces including the medical sphere, architectural arena, science lab and even on the battlefield. Yes, the US Army Research Laboratory (ARL) and Purdue University are currently examining the possibility of deploying 3D printers in combat zones which would be tasked with instantly fixing or replacing damaged equipment (including aircraft and ground vehicles), all while significantly cutting down on logistical costs. 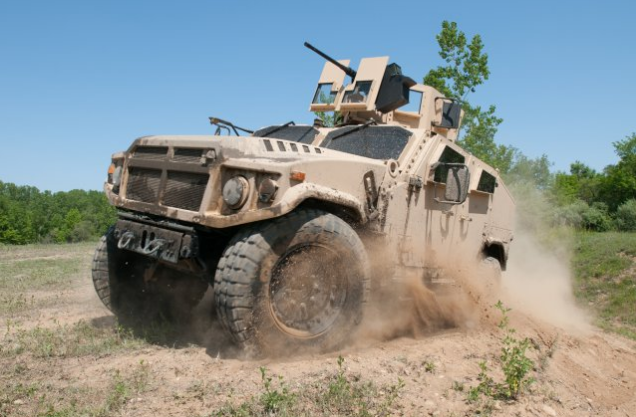 According to Ed Habtour, a research engineer with ARL’s Vehicle Technology Directorate at Aberdeen Proving Ground, scientists have found that combining the general purpose, finite-element analysis software ABAQUS with Python helps improves energy absorption and dissipation, productivity and lower maintenance costs. Habtour also noted that new structures created from this process are designed to be adaptive and configurable to the harsh conditions like random and harmonic vibrations, thermal loads, repetitive shocks due to road bumps, crash and acoustic attenuation. Plus, the structures can be configured to prevent crack propagation. This entry was posted in Design Trends, Engineering Perspectives and tagged 3D printer, ABAQUS, combat zone, fabricate and repair, FOBs, Forward Operating Bases, makerBot, Purdue University, Python, RepRap, segmented structures, US Army Research Laboratory (ARL) on August 29, 2013 by The Atmel Team.